The northern lights soar over Mt Drum and the Wrangell mountains. A great night a couple nights back with the northern lights. Shooting from near Glennallen, the lights were awesome. The view across the Copper River Basin toward those amazing Wrangell Mountains got even better as the lights lit up the sky. The mountains here are Mt. Sanford (partially obscured by) and Mt Drum. Mount Sanford is the larger of the peaks, at 16,237′ and Mt Drum perhaps the best known of the Wrangell Mountains, is just over 12 000′ at 12,011′. I’ve shot the Wrangell Mountains many times and the northern lights a few, but rarely have I had the good fortune to put the 2 together. Good times. 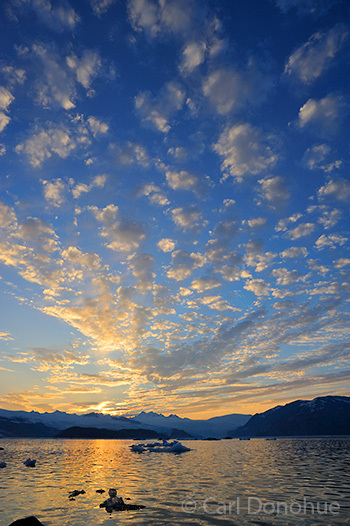 This entry was posted in Wrangell Mountains on November 25, 2017 by Carl D.
A gorgeous sunset over the Guyot Hills and Icy Bay. Part of the St. Elias Mountain Range. Wrangell – St. Elias National Park and Preserve. I shot this sunset over Icy Bay last summer. We had one night at Icy Bay, and what an amazing treat it was to have an evening like this! The sky got better and better. The icebergs came, almost on call, across to the east side of the bay, and everything just kept improving. Photography is all about time. Spending time in a place, and more time, and more again. Being there. Most often, we’re either not there, or “it” isn’t there. Sometimes, those rarest of moments, things turn out “just right”. And when that happens in a place like Icy Bay, it’s a treat indeed! Good times. 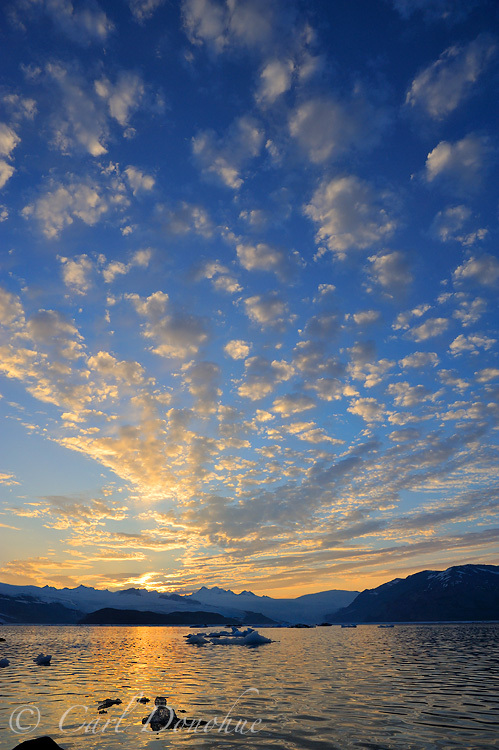 This entry was posted in St. Elias Mountains and tagged Icy Bay on November 6, 2013 by Carl D.
A test blog post. A photo of the Hubbard Glacier calving into Disenchantment Bay, near Gilbert Point.The Hubbard Glacier is one of the largest tidewater glaciers in North America, is extremely active, and a well-visited tourist destination. 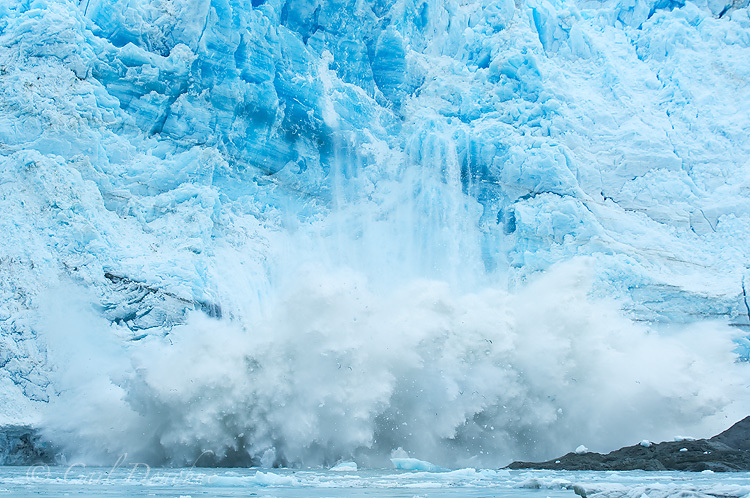 There are few experiences quite like watching a 200-300′ tower of ice crash into the sea! I shot this photo on a trip I made to the Wrangell – St. Elias coast in 2007, first to Icy Bay, and then up into Disenchantment Bay, Gilbert Point and Russell Fjord. This entry was posted in Rivers and Glaciers and tagged Hubbard Glacier on January 14, 2013 by Carl D.
An American Porcupine – finally, I got a decent photo of a porcupine. It’s funny, we envision wildlife photography as a pursuit of the exotic. Wildlife photographers spend hours, days, weeks, months and years trying to capture those charismatic megafauna; the wolves, the bears, wolverines, eagles and owls and such. Yet we overlook the common; the raven, the squirrel, and, yes, the porcupine. 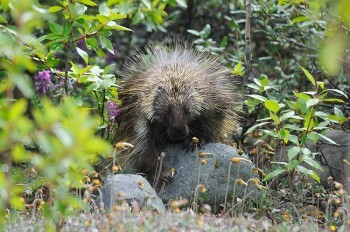 I’d wanted, for a long time, to make a decent photo of a porcupine, but never had much luck with it. Well, not so much as luck, but I didn’t really put the time into that specific pursuit. I hoped I’d make a good porcupine photo someday, but didn’t spend my time in places where I was likely to see one. Mostly I’d see them in passing, while I was doing something else, like skiing or snowshoeing, or driving down the road. And inevitably, when I’d see a porcupine, I’d miss the opportunity for one reason or another. Or, I’d catch a photo, but the porcupine spends so much of his time sitting in the thick of trees, surrounded by very un-photogenic branches and tree limbs; so I’d get photos that, well, bluntly, sucked. This photo I took on a spring trip I did up the Nizina River valley, near the toe of the Nizina Glacier. The porcupine had ventured out on to the broad open riverbed, feeding on fresh shoots of the poplar tree saplings that about in that dry, rocky ground. I was able to position myself in a place I thought he’d wander towards, and with a bit of good fortune smiling my way, he did just that. Cute little fella! This entry was posted in Wildlife and tagged American Porcupine on May 25, 2012 by Carl D.
Mount Sanford, early morning, fall colors and a kettle pond, boreal forest, Wrangell – St. Elias National Park and Preserve, Alaska. Mount Sanford, just after sunrise one gorgeous fall morning, is a real treat to see. 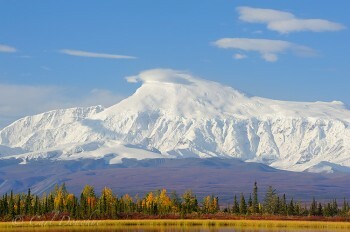 Mount Sanford stands 16 237′ tall, is the 6th highest mountain in the United States, and the 4th highest mountain in Alaska. Mt. Sanford was first climbed in 1938 by noted mountaineer and photographer Bradford Washburn and his climbing partner Terris Morris. Mount Sanford is one of the more regularly viewed mountains in the park, because it’s so clearly visible from the surrounding roads. 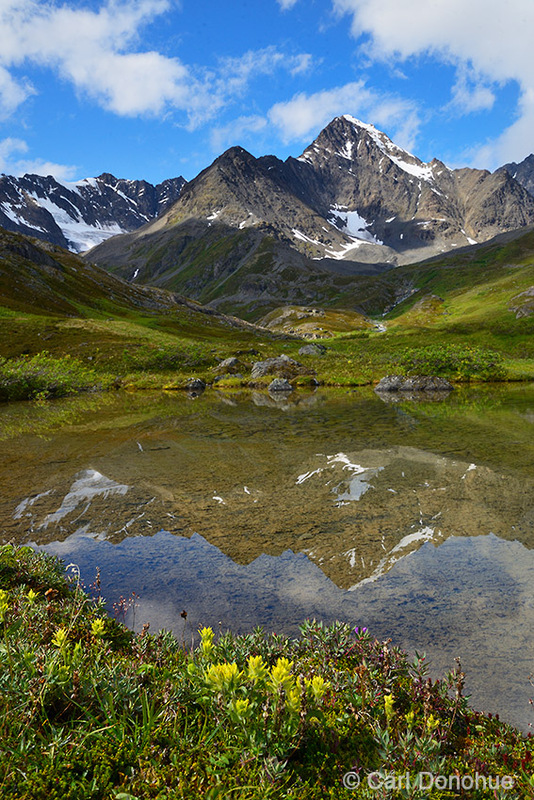 Mounts Bona, and Saint Elias, for example, are both taller mountains, but are deep within the park’s backcountry. Two favored viewing areas for Mt. Sanford are Simpson Hill Overlook and Willow Lake, both off the Richardson Highway near Glennallen, but I prefer the views from the Nabesna Road. Mt. Sanford towers over the expansive Copper River Basin, and is really a site to behold. This entry was posted in Wrangell Mountains and tagged Mt. Sanford on May 24, 2012 by Carl D.
Lupine fields and the calm waters of Icy Bay sit beneath the towering peak of Mount. St. Elias, an 18 008' peak, 2nd highest peak in Canada, 2nd highest peak in the US (it sits on the border of both countries), Mount St. Elias is the highest coastal peak, and the St. Elias Range the highest coastal mountain range, in the world. 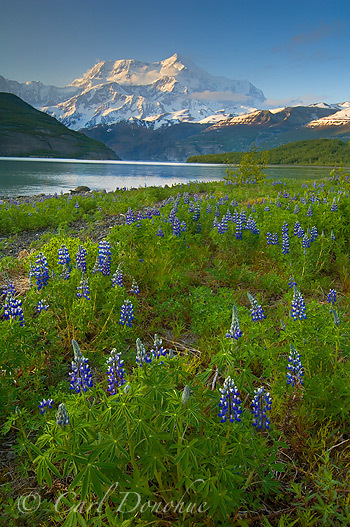 Mount St. Elias, Wrangell - St. Elias National Park, Alaska. Welcome to Wrangell St. Elias National Park and Preserve; the largest, grandest and wildest of the many US National Parks. 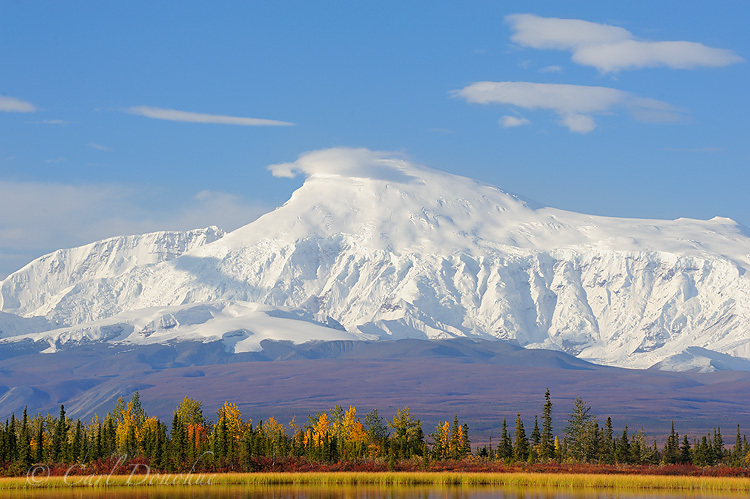 This blog is an introduction to this special place, and what better way to get it started than a photo of one of the park’s namesakes, Mt St. Elias? Taken on a kayaking trip to Icy Bay, this is one of my favorite photos of the 2nd tallest mountain in both the US and Canada. Mt. St. Elias, at 18 008 above sea level, sits right on the US/Canada border. Icy Bay is perhaps the grandest view of the mountain, if not one of the grandest views of ANY mountain. It’s simply a fantastic place to visit and enjoy the power of a magnificent mountain. I look forward to adding to the blog from time to time, and introducing you to some of these favorite places, showing photos and telling stories from Wrangell – St. Elias National Park; truly “A Wilderness Park”. 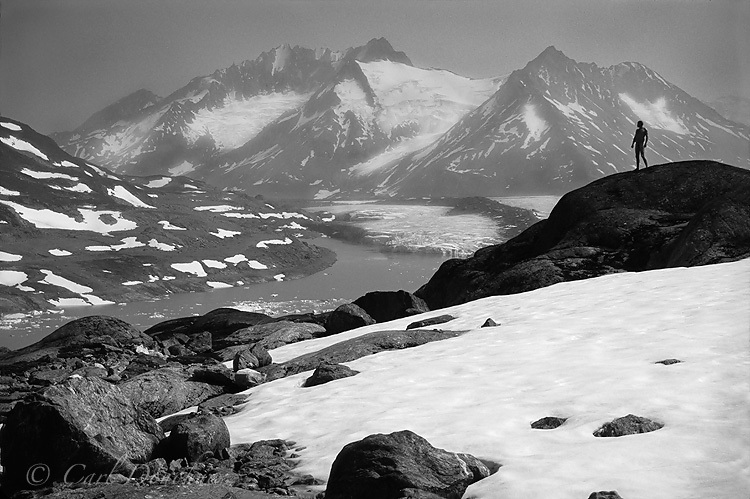 This entry was posted in St. Elias Mountains and tagged Icy Bay, Mt. 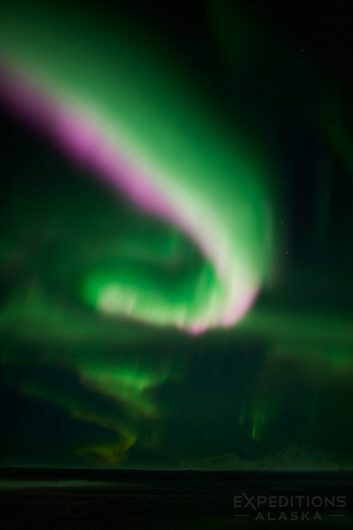 St. Elias on May 18, 2012 by Carl D.